Check-in for Gulf Air is located in Zone B of London Heathrow Terminal 4, and offers a satisfactory experience. The most notable weakness will be observed by premium passengers, who receive no enhancements at the single Business Class desk. Although the branding around check-in matches most other airlines in the terminal, the tall signage is badly marked and damaged and the area is quite run down and simpler than one might expect. Whilst self-check-in units are located next to the desks, these are not available for Gulf Air passengers, and all customers must use the staffed counters. The staff service is quick and efficient but lacks any real customers service focus with minimal dialogue and flight information provided. Boarding is at Gate 7, just a short walk from security. The boarding service is simple and well organised, however, there is limited branding available and passengers must rely on PA announcements to know which queue to join. Premium and Business Class passengers get priority boarding and unlike some other airlines there is no attempt to board Economy Class passengers according to row number. The Airbus A330 in Economy Class was at approximately 95% capacity. Economy Class passengers get a generous checked baggage allowance of 30kg along with hand luggage of no more than 6kg and a laptop / hand bag. This is quite stringent compared to many airlines, however it is clearly exceeded by many customers onboard. Falcon Gold passengers (Business Class) are allowed 40kg of checked baggage along with an 8kg hand luggage bag and laptop / hand bag. This Economy Class seat has a 33-inch seat pitch and 18-inch width, in a typical 2x4x2 layout. The seats are upholstered in alternating blue / grey leather and the condition is quite good. There are no power sockets onboard but the new PTV does give passengers access to a single USB port. The seat is comfortable and relatively spacious for the 6.5-hour flight. The cabin is clean on boarding and the carpets and seat covers well presented – the overall condition of the aircraft is not pristine with some marks to the cabin panels / windows and evidently the attention to detail is not as good as other Gulf and Asian airlines. Passengers should not expect mood lighting or any additional aircraft features which can be found on the newer generation of aircraft. There are 4 washrooms located between the 2 Economy Class cabins. The washrooms appear well used and dated. There are no amenities available, apart from Gulf Air branded hand soap. The flight arrived into Bahrain 1-hour behind schedule, as the aircraft had to return to the gate to offload a passenger. Initial information on the delay was unclear with poor PA communication by the captain. However, correct information was eventually given and apologies made. Service begins shortly after departure with the staff offering a selection of beverages and a snack (crackers). The selection is reasonable with wine, beer and soft drinks available. Whiskey is the only spirit so some passengers may well be left disappointed. Alcohol is not proactively offered and staff only suggest soft drinks and juices. On a positive note, whole cans of soft drinks and beer are given which is becoming increasingly unusual on many airlines. The meal tray is served approximately an hour after the beverages and this is a frustrating delay. The lack of intensity was compounded further by the use of just a single cart per aisle and for passengers at the rear of the aircraft the meal was not served until 2-hours after departure. A second beverage service follows immediately after the meal tray. The food is meeting a good standard, with 3 entrée options available (lamb and rice, cod and rice and vegetarian lasagna). The lamb dish is chosen and the flavour is excellent – everything was cooked nicely. Texture was not an issue and overall it was enjoyable. The meal tray also comes with a tasty potato salad, delicious cake and cheese and crackers. The bread roll is served warmed and tastes freshly baked. Presentation of the meal tray is also good and aside from the delayed service the dining experience is really quite satisfying by Economy standards. Unfortunately there is no second meal service prior to arrival and many other airlines still offer a small snack or sandwich on flights of similar length. Midflight there are a few services of tray drinks but this is somewhat inconsistent in terms of the timings. 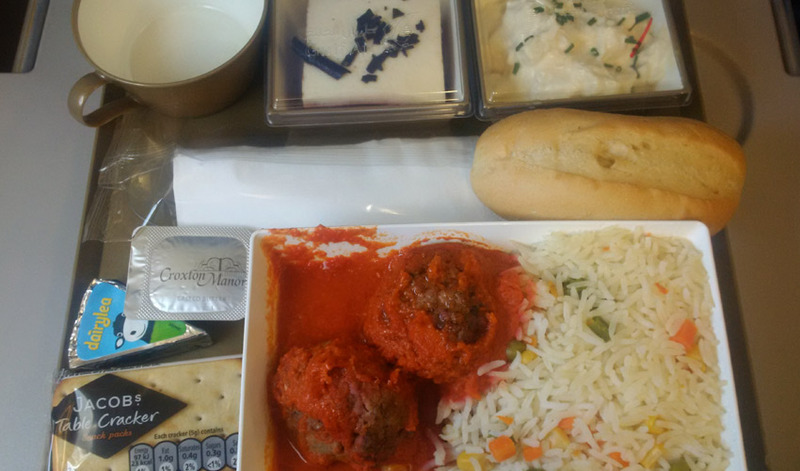 Overall the quality of the food is good and Gulf Air offers a competitive and enjoyable meal tray service. However, the poor intensity, lack of any secondary service and inconsistent staff presence means other airlines perform better on routes of a similar length. There is a 9-inch, touch screen PTV which offers a simple and intuitive user interface. The quantity of programming offered is good with a range of latest movies and mostly American TV dramas. 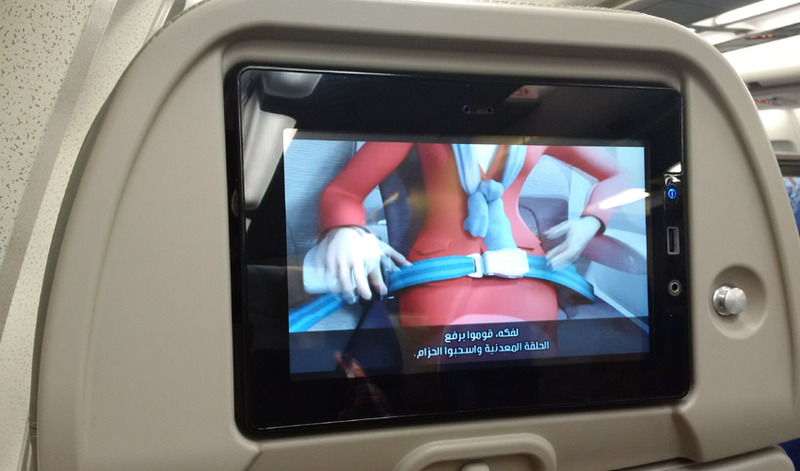 The selection is not as large as some other Middle Eastern or International carriers, however, for the 6.5-hour flight it was sufficient and offered good viewing. 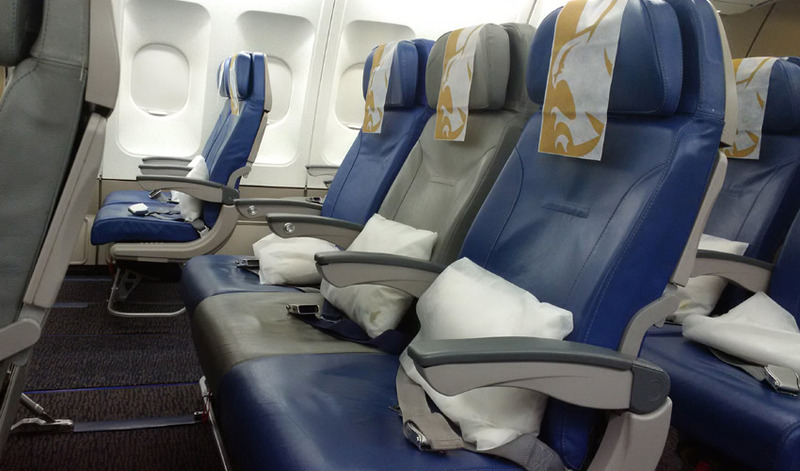 Pillows and blankets were available on the seat during boarding and these are industry standard. 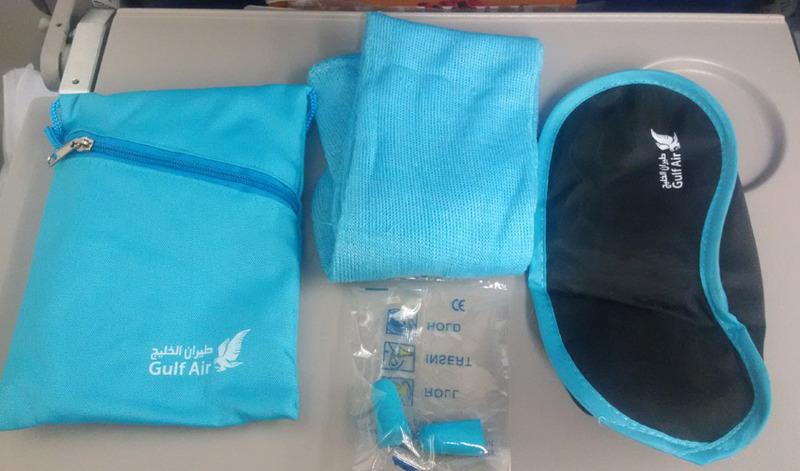 A small amenity kit is also available on the seat and this included socks, eye mask and ear plugs. It is a good product for a flight of this timing and length. The staff service was average with no attempt to engage with passengers beyond the absolute minimum required – the staff are not rude but they did not come across as especially enthusiastic or friendly. They are professional and appear comfortable with the service format, however, the service feels distant and cold. The hard product is mixed – the seat appears somewhat dated but it remains relatively comfortable with a 33-inch seat pitch which is positively colossal by modern standards. The IFE hardware and content is good and whilst the selection is not huge it does cater for a range of customer tastes (including Bollywood and other Asian cinema). The main meal service was excellent in terms of quality but it was disappointing not to receive a small snack or sandwich prior to arrival. Staff presence during the rest period is another inconsistent aspect and passengers can easily find themselves going thirsty. The aspect of the flight most disappointing is the staff service. Very little effort was made with customers and at no point did the service go beyond the minimum required. 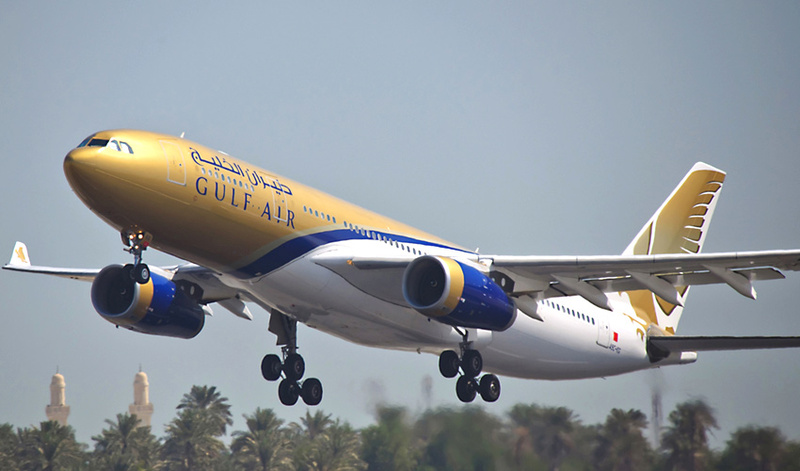 Overall, Gulf Air offers a competitive product on routes to the Middle East and passengers can benefit from a spacious seat and good food, however, do not expect service to be particularly memorable.